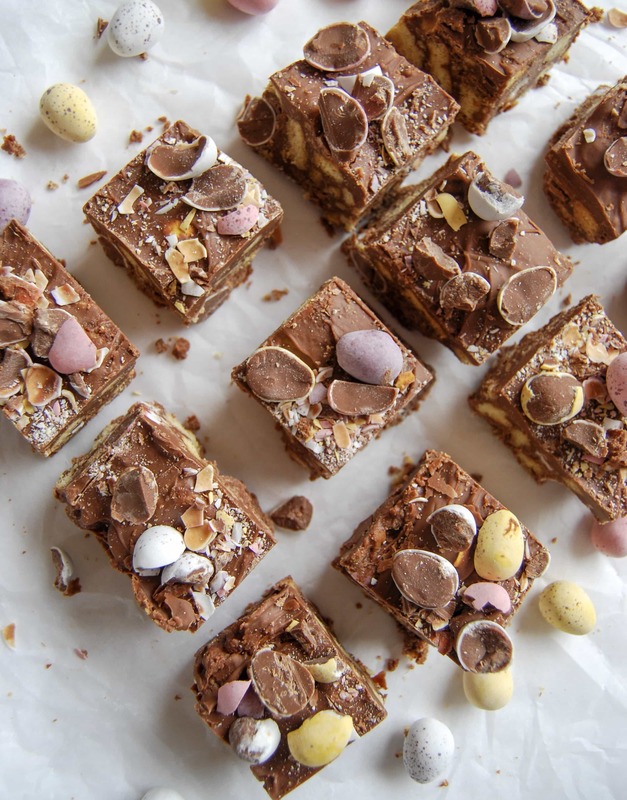 This easy no bake chocolate Easter fridge cake would make the perfect homemade Easter gift! I absolutely love Easter. To me it’s all about spending time with family, eating good food and there’s no rushing around the shops trying to find the perfect gift! It’s kind of like Christmas but without all the pressure don’t you think? And of course there’s all the chocolate…. 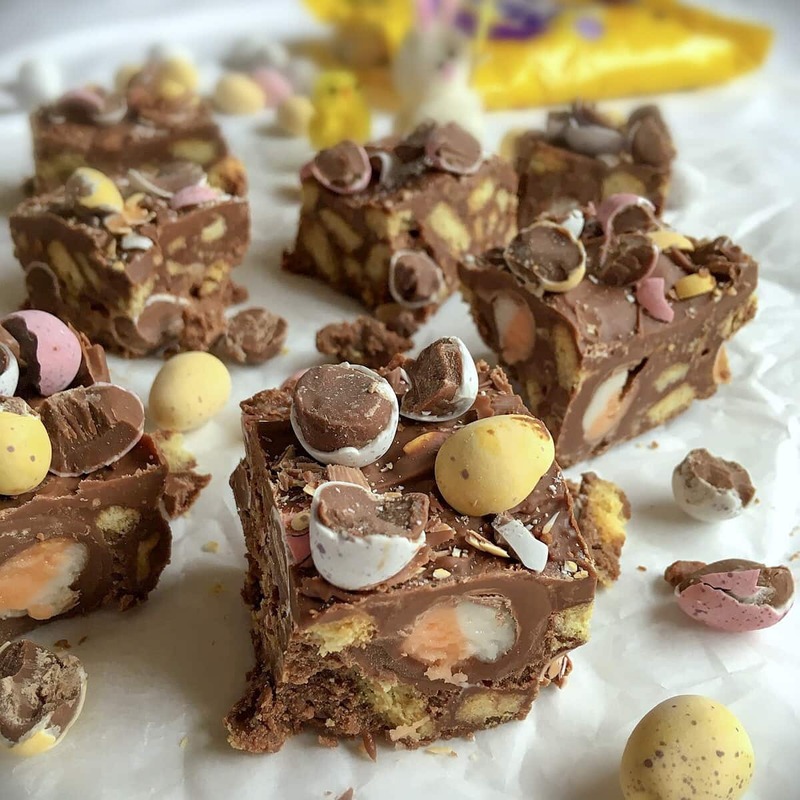 This Easter themed no bake chocolate fridge cake is loaded with.. 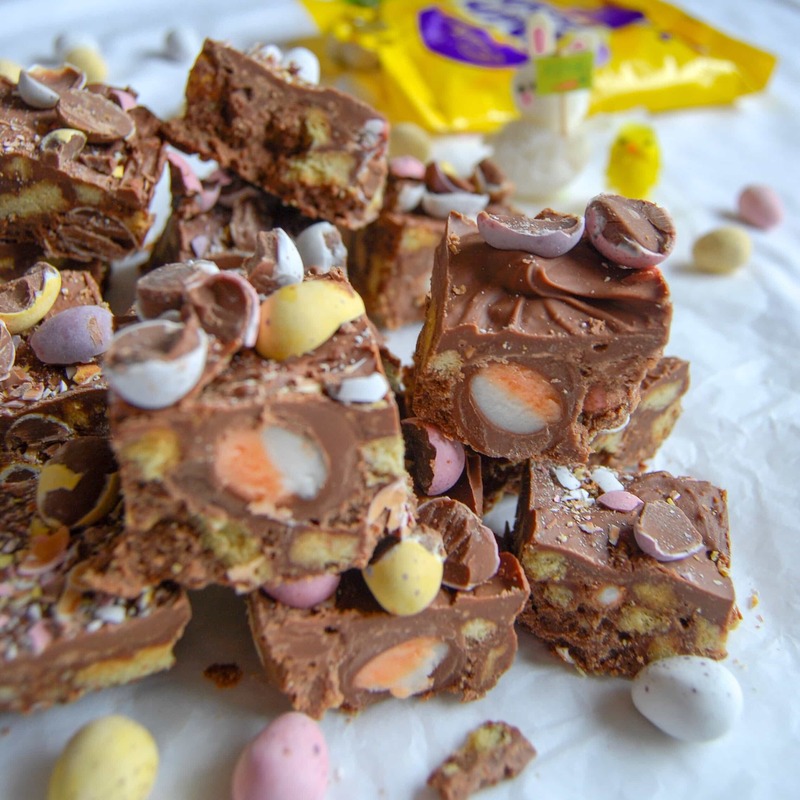 I was going to call this Easter rocky road, but silly old me realised that rocky road isn’t rocky road without marshmallows. You could add some if you wanted, but I just love it as it is. I made this on Sunday afternoon and it was all gone by Monday morning. It’s addictive stuff! Don’t say I didn’t warn you. An easy no bake chocolate fridge cake filled with lots of Easter treats! 200 g digestive biscuits broken into small pieces - I tip the biscuits into a large freezer bag and pulverize them with a rolling pin - very theraputic! What you're aiming for is both crumbs and larger pieces of biscuit. Grease and line a 22cm square tin with baking paper. Melt the chocolate, butter and golden syrup together in a large pan over a low heat. When the chocolatey mixture is smooth and melted, take off the heat. Tip in the biscuit pieces. Leave for a few minutes before adding the mini eggs and mini creme eggs. Tip the mixture into the baking tin and pop in the fridge while you get on with the chocolate topping. Melt the 150g chocolate in a bowl set over a pan of simmering water until smooth and glossy. Pour the melted chocolate over the chocolate slice, slightly tilting the pan so the chocolate reaches the edges. Scatter the crushed mini eggs over the top and place back in the fridge to set before cutting into bars. I shared this post with the following link ups…. Ahhh, this looks lush! I love fridge cake, and adding creme eggs to anything this time of year is a win ?